Mani Malaichamy proudly surveys his Kaki Bukit office, filled with barrels of paint in different colours, before opening the door to show me his new 2.4 litre, white Toyota Harrier. "I really believe God gave me everything," he says, eyes darting to a poster of Ganesha, the Hindu elephant god, pinned to a wall. The 47-year-old, who shelled out $420,000 to buy the office two years ago, is referring to the glorious way his life has panned out: An Indian migrant worker who arrived penniless in Singapore 20 years ago but defied great odds to found a painting company which pulled in $2.6 million in revenue last year. "But I have a second 'god', Mr Ang Ah Teng," says the managing director of MMM Contract Services. Mr Ang is his former employer, a man who, he says, taught him everything he knows and encouraged him to spread his wings. The youthful looking Mr Mani speaks fractured English in an almost Singaporean accent. The youngest of seven children, he is originally from a small village near the town of Tirrupatur in Tamil Nadu. His parents were poor rice farmers who often had to borrow money when droughts destroyed their crop. To supplement their income, the family also reared goats. Growing up, he remembers going to the fields with his school books to be a human scarecrow to frighten birds. "I finished school at 17. After that, no more studies. One thing, no money. Another thing, have to help the family," says Mr Mani who completed his secondary education at a village schol. Jobs were not easy to come by. For some time, he worked as an assistant in a provision shop in Chennai. He also had a stint teaching illiterate seniors to read and write under a programme by India's Ministry of Education. When there was no work, he helped out on the farm. "In a kampung, no need much money because no need to spend. We planted our own rice and vegetables; we didn't need to buy a lot of things," he says. But he dreamt of getting a job which would pay well enough for him to build a house and help his parents pay off their loans. "My two elder brothers did not help the family after they got married. I wanted to make money to help my parents and so that my sister could get married," says Mr Mani, who has four sisters. He wanted badly to come to Singapore. "There were many agents in my village recruiting workers to work here," he says. The only snag was the hefty commissions they charged. When he was 28, his brother-in-law - then a migrant worker in Singapore - cobbled together $4,000 and arranged for an agent to find Mr Mani a job here. The gregarious man remembers the day he landed in Changi Airport. "I saw everything very nice and very beautiful. The Chinese people at the airport said my name very different. The smell here also very different," he recalls with a laugh. His employer was a property development company in Marine Parade. Instead of a construction site, he was dispatched to the office of one of the company's new condominium developments in Bukit Timah. "That's because I could speak a little bit English. The other workers could not," he explains. His job included painting and fixing minor defects in the condo units. The company allowed him to sleep at the site office. "I was very happy because I was alone. No one to disturb me. At night, I could read," says Mr Mani who devoured Rapidex, a popular series of English coursebooks for Tamil speakers. He was paid $18 a day, and could earn a few more doing overtime. "I worked every day, from Monday to Sunday, from 8am to 7pm, and until 10pm if there was overtime. My pay was about $600 a month, I don't go out except on Sunday evenings when I finished work. I went to Serangoon to talk to friends and relatives from my village," says Mr Mani, who saved money by cooking his own meals on an electric cooker in the carpark outside his site office. Because he was so prudent with his spending, he paid back the $4,000 to his brother-in-law in a little over a year. He also set aside some to take English classes at a school for foreign students in Orchard Road. Occasionally, he also handed money to an agent to take home to his parents in India. On the advice of his boss, he got himself certified by the Construction Industry Development Board not long after. After four years here, he returned home to India to get married. By then, his daily pay had gone up to nearly $30. "I was already 32, so must get married mah," he says, using the Singlish word often used to express something which is obvious. The marriage was arranged by his parents. His wife, Madam Mamathy, 40, has a Master's in Commerce from Alagappa University. "But she never worked. Many women are very educated but never work, very common in India. I only saw her once before we got married, when she was 12 years old," he says. That he was not as highly educated was not an issue. "It's nothing. She and her parents know I have talent, and that I would make money and take care of her. They know what I can do, they know I can learn things very fast," he says proudly, without a hint of conceit. It took him eight months and another agent to find a higher paying job in Singapore. By then, his wife was pregnant with their first son. "I had to come back. I had only enough money to get married but not to buy a house. I also had to pay for my sister's marriage," he says. His new employer was ATC Painting Specialist, owned by Mr Ang. Mr Mani's resourcefulness and eagerness to learn earned him many opportunities. "I did many things. I was driving a lorry, fetching workers, collecting cheques, making payments, supervising, taking care of projects," he says animatedly, adding that he also took a three-month course to get certified as a safety officer. "My boss made me a supervisor. Every year, increase in pay, and bonus," adds Mr Mani, who sent the bulk of his pay to his wife in Chennai. Unlike his colleagues who lived in hostels, he preferred to sleep in his company's paint shop. "I liked (being) alone. I don't like to join them... quarrel, quarrel. Anyway I parked my company lorry there, so it's easy for me," he says. Mr Ang, 53, says that his employee fell sick often when he first joined the company. "I think he was not used to the weather. But he's hardworking. If he wasn't, I wouldn't have hired him. I taught him a lot, and he was not a bad learner," he says. By 2005, Mr Mani was earning nearly $3,000, enough for him to get an S Pass, granted to middle-level foreign workers. Mr Ang also advised him to apply for dependent's passes for his family. "Actually, I wanted to start a business in Chennai. I already bought a small piece of land. I wanted to build a two-storey house, use the bottom for a shop and live upstairs. But my boss encouraged me to try and apply for my family to come to Singapore." He did, successfully. In 2006, they became permanent residents. His journey, he says, did not happen without sacrifices. "I worked so hard. I didn't see my elder son till eight months after he was born. I could only afford to go back once every five years. "When my father died in 2004, I did not even go back. I just went to a corner and cried. I was doing an urgent project. And I was scared that if I went back, I would lose my job. That was what happened to my father, who worked in Sri Lanka. When my grandfather died, he went back to India but after that, he lost his job in Sri Lanka." When his wife and elder son Arul Prakash, now 15, arrived in 2005, they lived in a one-room rental flat in Bukit Merah. A few years later, he bought a three-room HDB flat in Bedok on the resale market. His younger son Areesh Prasanth was born in Singapore in 2010. Getting his PR gave him the confidence to act on his entrepreneurial dreams. "I know I could come out and do business. I know my customers, I know how to apply for workers. But I thought of my boss, he taught me everything. Without him, my family would not be here with me." Mr Ang, however, encouraged him to strike out on his own. Mr Mani says: "He said, 'You go out and fight. If you are not successful, you can come back.' Where to find boss like that? Even I cannot be like that. I was so happy I cried," he says. With his boss' blessings, he started MMM (his initials as well as those of his father and wife) in 2007 while still working at ATC. He accepted small jobs painting houses and bungalows at night and on weekends. Three years later, he quit ATC, put $10,000 of his savings and plunged into his business full-time. He hired two workers, and got himself a second-hand motorcyle to run around on. An interior designer got him his first major contract, worth $150,000, to paint a factory in Woodlands. "I'm very lucky. All my Singaporean customers have been very good to me. They like me and give me a lot of jobs," says Mr Mani who now has 26 staff, including a couple of Singaporeans. He has another electrical services company. Even Mr Ang passed him contracts, including one to paint Greendale Secondary School in Punggol. Since then, Mr Mani has landed contracts to paint several other schools including Marymount Convent and CHIJ Katong Convent. Asked why he went out of his way to help his former employee, Mr Ang says: "It's very simple. I'm growing old. There's also a lot of work to go around. If he can chiong, let him do it," he says, using the Hokkien word which means to take risks. "You cannot keep everything for yourself. Anyway, if he's successful, I'm happy for him." Mr Mani has taken a leaf from his boss' books on how to treat staff. He organises company trips to Malaysia and invites them over to his home for meals often. "When you treat them well and become their friend, they will be so happy to work for you," he says. He and his family have adapted happily to life in Singapore. "When I first came to Singapore, the smell of durian made me want to vomit. But now I love it so much. 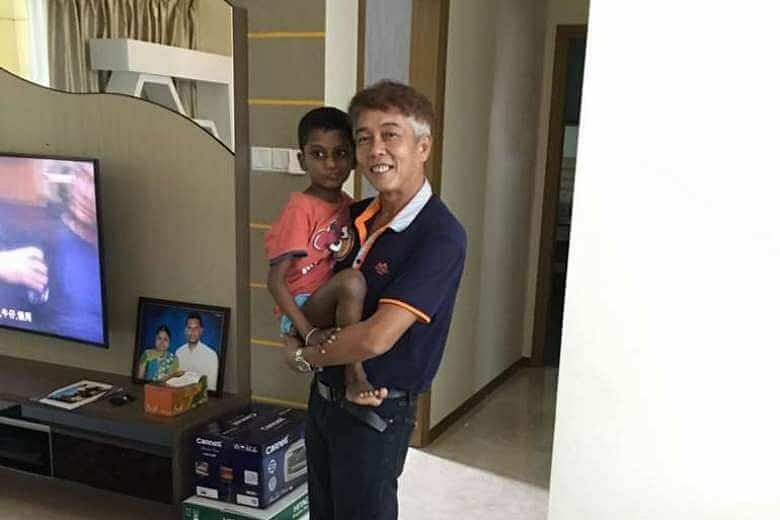 I also love eating mee goreng for breakfast every day," says Mr Mani, who worships at Senpaga Vinayagar Temple in Ceylon Road and is active in the Parents' Support Group at Temasek Secondary School where Arul is a student. He has, he says, worked extremely hard for what he has but sometimes finds it hard to believe he has come so far. Last April, he and his family moved into a $1.2 million condo in Pasir Ris. He says: "I used to paint condos but I never dreamt I would one day live in one."